Looking for a sport that everyone wants to play? Sport Court of Carolina pickleball courts are designed for young or older players with varying degrees of mobility to enjoy. The whole family can enjoy pickleball which provides a combination of badminton, tennis and table tennis. Pickleball is a described as "a combination of ping-pong, tennis, and badminton", played in schools, parks and recreation centers, camps, and retirement communities mostly in North America. It uses a simplified combination of tennis rules and strategies. The court is the same size as a badminton court (20 feet wide by 44 feet long). The net is set at 36 inches high on the edges and 34 inches in the middle. 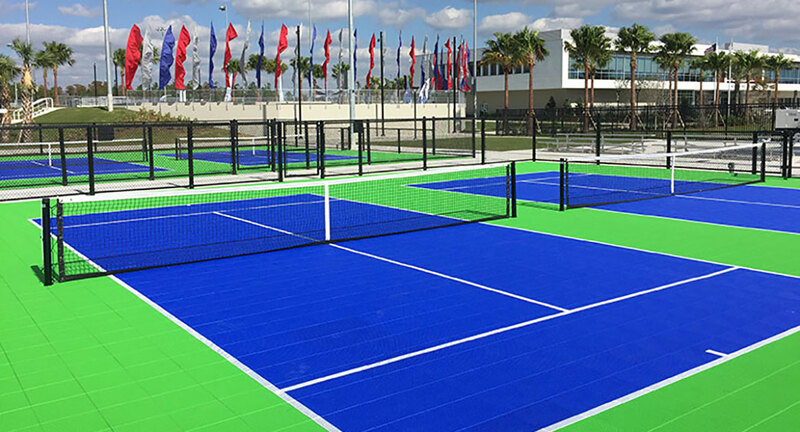 Contact us for creating & building your dream Pickleball Court!